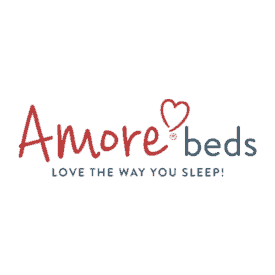 Amore Hybrid Mattress Review - Is This The Latex Bed for You in 2019? If you’re looking for luxury and latex without the large price tag, you might be interested in the Amore Luxury Hybrid Mattress. This bed combines foam for pressure relieving comfort and a coil system for bounce, all made with natural and U.S. – sourced materials. The Amore Hybrid mattress comes in two comfort levels — medium and firm — and today I’ll be reviewing the medium option. From construction to mobility, pressure relief to price, here’s everything you need to know about the Amore Luxury Hybrid mattress. Continue reading for all the fine details. If you’re short on time, simply click here to jump down to the review summary. Amore’s company’s motto is “we’ve got you covered — naturally.” This play on words is a nod to its use of natural and organic materials throughout the product line, from Amore mattresses and pillows to sheets and box frames. Some materials they feature included copper-infused bamboo rayon and organic wool. In addition to using eco-friendly foams and fabrics, the company also emphasizes personalization. Sleepers can choose if they want their side of the mattress to be firm or soft. Fittingly called “Amore Dual-Firmness Split,” couples with different sleep preferences might enjoy not having to compromise on comfort level. The Amore Luxury Hybrid is a 12.5” hybrid mattress comprised of various layers of latex and poly foams and a pocketed coil system. Let’s take a look under the covers! Cover – The Amore cover is made with organic cotton and quilted with 1” of wool. For an added cost ($60), you can choose a copper ion-infused cover, which could add some cooling qualities to your sleep. 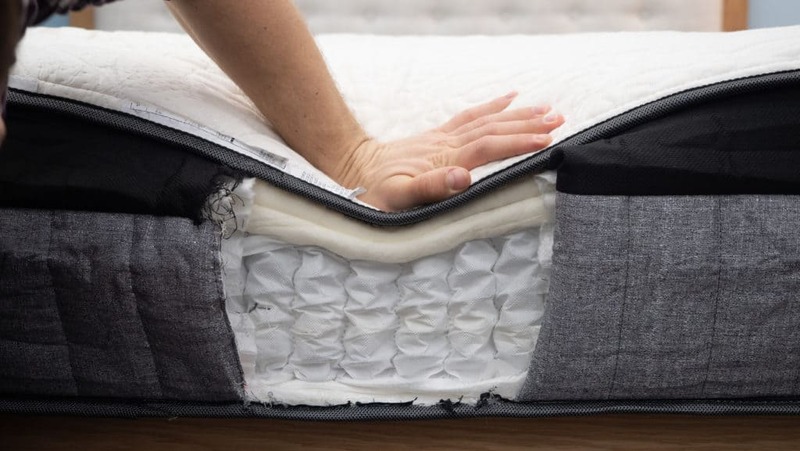 Overall, I thought the cover was really soft and created some immediate pressure relief and sinkage, something that’s helpful for side sleepers who need a little love for their hips and shoulders. 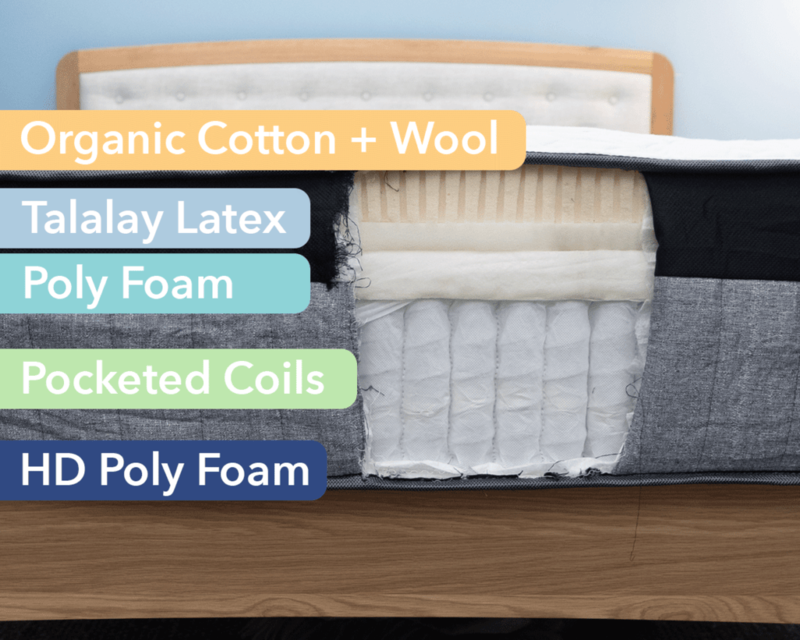 Comfort Layer – The comfort layer is constructed with 3” of Talalay latex, a type of foam that goes through a specific aeration process to produce a soft touch and a lot of bounce. Often, this kind of latex is seen as a more refined and luxurious choice over other foams like Dunlap latex. The Talalay here renders a soft, yet mobile experience to the mattress, so you should feel like you’re lying on top of the bed versus sinking into it — even with the plush quilt above. Latex is also known for dissipating body heat, a nice detail for folks who tend to sleep hot. Transition Layer – As we move down the bed, there’s 2” of firmer polyfoam that helps the sleeper “transition” from the latex foam and into the coil system. In general, this movement from the soft cover to the firm transition layer provides strong cradling support as the sleeper experiences the various layers of the mattress. Support Layer – Here is where the coils come to play! 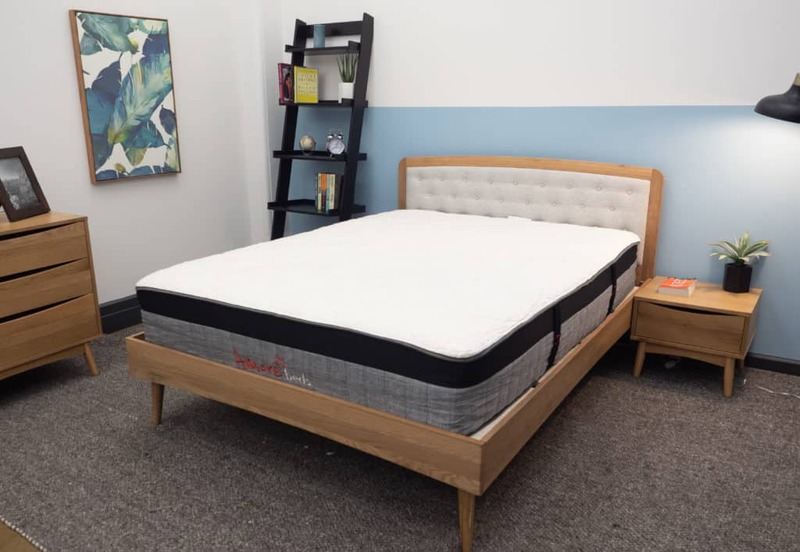 The Amore Hybrid mattress features 6” of pocketed coils that provide a bit of bounce and natural airflow to regulate temperature better than if this bed were built entirely of foam. These coils, coupled with the latex foam, means the bed will be bouncy and you shouldn’t feel too stuck. Base Layer – The bottom layer of The Amore Luxury Hybrid is constructed with 1” of really firm, high-density poly foam that gives solid support to the entire structure. While you won’t really notice this foam, it supports the coil system and adds durability to the entire structure. Now that we’ve looked at what’s inside the Amore Hybrid mattress, let’s talk about how you might feel on top of it. 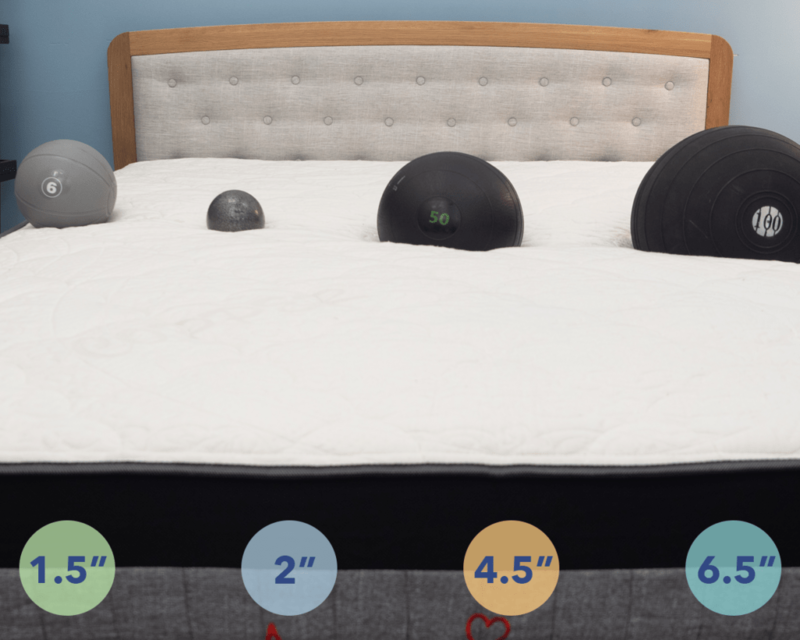 Remember, I’m reviewing the medium firmness option — the company also offers a firm bed for folks who want a little less softness and more support for the shoulders and hips. To begin, I’d give the Amore Luxury Hybrid a 6.5 out of 10 on the firmness scale, labeling this bed a true medium firm. 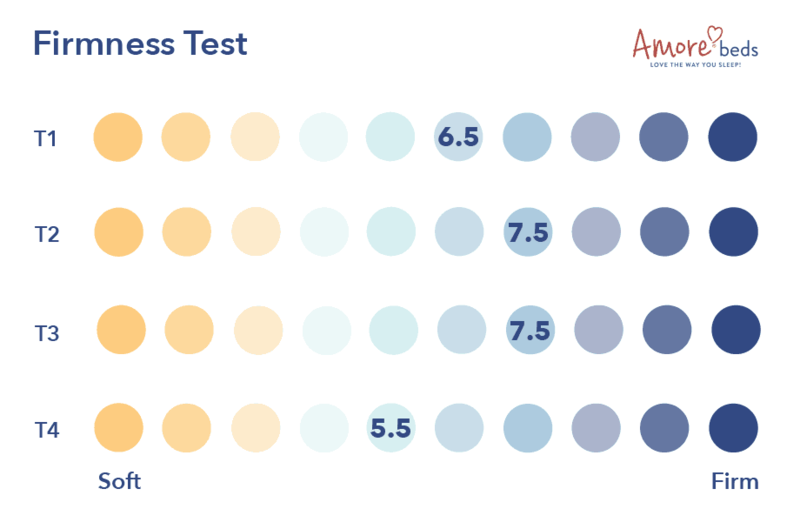 I asked a few other testers what they found, and they rated the mattress a bit differently — some gave it as high as a 7.5 in firmness, while one said it felt like a 5.5/10. All of this goes to show that personal preference often plays a big role in mattress firmness! However, my 6.5 rating reflects what I experienced when rolling around on the mattress. On my back, while I did sink into the 1” quilted wool cover, the bounce of the latex foam and coil system beneath it definitely provided an “on top of mattress” feeling. As for my side, the soft cover promotes a decent amount of pressure-relieving sinkage for my shoulders. That said, the Talalay latex definitely does not give a “hugging” or “contouring” feel that a material like memory foam might produce. 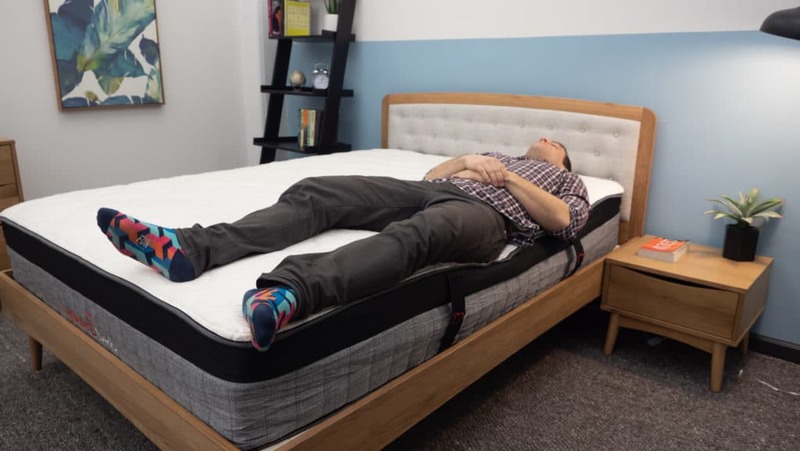 Therefore, while strict side sleepers might need something softer for the hips and shoulders, combo sleepers who need a healthy balance of gentle pressure relief, firm support, and mobility, might find a lot of luck on this latex bed. 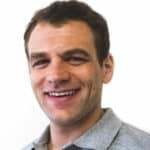 As for stomach sleepers, while you’ll get decent support from the hybrid construction, your hips might sink a little bit too much in the mattress because of the soft wool cover. Luckily, if you’re worried about getting enough support, you can test out Amore’s firmer mattress. All in all, The Amore Luxury Hybrid has a bouncy, medium firmness, with a little bit of pressure-relieving softness from the wool cover for the shoulders and hips, and a reliable, “on top of bed” experience from the bouncy latex foam and pocketed coils. You won’t get contouring and sinkage in this bed, but you will get lots of mobility, making it easy to change positions throughout the night. A helpful way to decipher how well a mattress will relieve pressure is to test it with my pressure map, which can highlight where these pesky points of tension could form. I placed the map on top of the mattress and recorded results after laying on my back, side, and stomach. The results are on the image below, where pressure is represented from blue (low pressure) to red (high pressure). Back – On my back, you’ll see blue on the map, which means my weight was evenly distributed across the mattress with no detectable pressure points. While I did sink a little into the cover, the bounce of the latex and coils kept me lifted on top of the structure. Side – You’ll see some green on the map, which indicates a bit of pressure build up. That said, if this bed was a lot firmer, this map might populate with yellow or red spots. The medium firmness combined with the soft cover provides some pressure relief, though I would look for a softer bed if you strictly sleep on your side in order to better support the shoulders and hips. 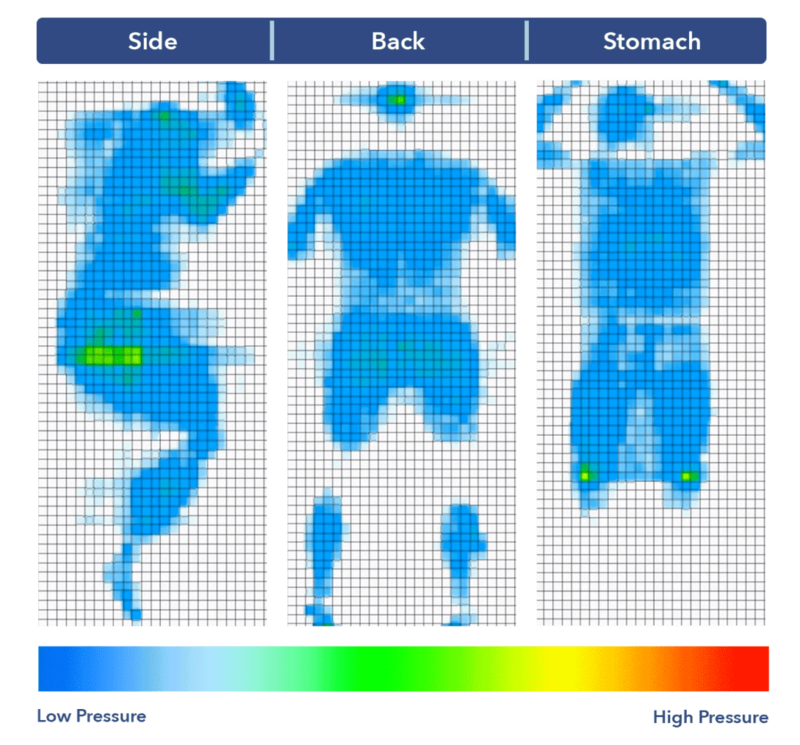 Stomach – Similar to my back, there is blue across the board, signaling my weight was evenly distributed across the bed. While I didn’t find my hips sinking in too much, strict stomach sleepers might be more comfortable on the firm version of the Amore as it’ll promote an overall healthier spinal alignment. As I mentioned in the firmness section, I definitely experienced a “laying on top of bed” feeling feeling stuck inside the bed. Another way to verify and visualize this is to run a sinkage test. I placed four balls of varying sizes and densities (a 6 lb medicine ball, a 10 lb steel ball, a 50 lb medicine ball, and a 100 lb medicine ball) on the mattress and measured how much they compressed the surface. Based on the graph above, there’s actually more sinkage than I’m used to seeing when I run this test. The is because of the plush, soft wool on top of the bed. That said, I ran a bounce test to see if the body might “ bounce back,” even with some immediate sinkage. As I suspected, the latex and coils are still quite bouncy, and you’ll still feel “on top” of the bed even with the plush cover. The last test I ran was all about motion transfer. Understanding how well your mattress isolates motion is especially important for couples who might disturb one another if they toss and turn at night. Since this bed does have a lot of bounce and a quick response to pressure, I wanted to see how it performed when I dropped a 10 lb. steel ball from various heights. More specifically, I dropped the 10 lb. steel ball from heights of 4 inches, 8 inches, and 12 inches and measured the disturbance it caused. The bigger the lines, the bigger the disturbance. Each drop is meant to symbolize a different movement you’re likely to experience in bed, from tossing and turning (4”) to getting out of bed (8”) all the way to full on jumping (12”). Unsurprisingly, because of the bouncy nature of the latex material, there is a bunch of disturbance transferred across the bed. This is common for most latex beds, so no need to panic. Just take note, especially if you sleep with someone who moves around a lot in bed. Is the Amore Hybrid Mattress Right for You? 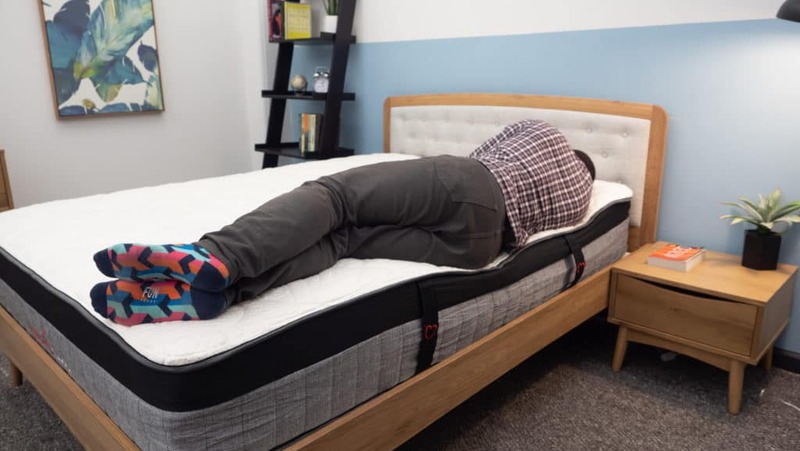 Now that I’ve taken a close look at the Amore Hybrid mattress, here’s a handful of reasons why it could be a good fit, along with a couple of things to look out for. You’re a combo sleeper – The springy coils and bouncy latex means you’ll be quite mobile on this bed, and should be able to change sleeping positions with ease. 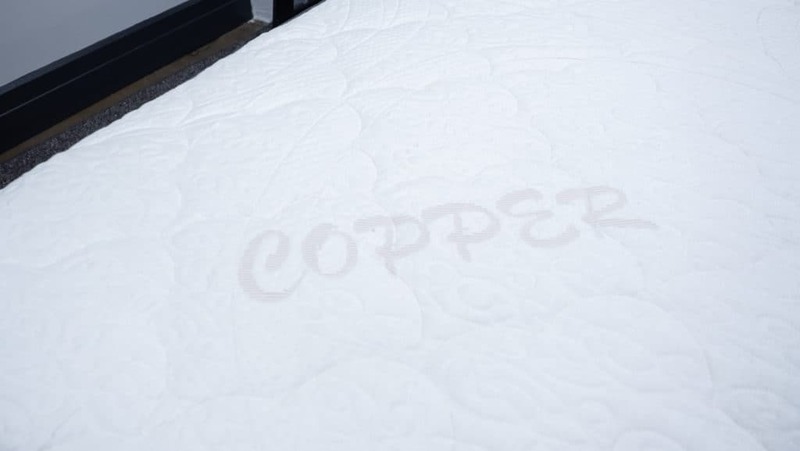 You tend to sleep hot – If you choose to up-level your mattress with the copper ion-infused cover, you might get some of the cooling properties copper is known for. In addition, the pocketed coil system allows air to move freely through the bed, promoting breathability, while latex is naturally known for dissipating heat. You want latex without the large price tag – Latex is known for being a bit more pricey than other foams due to its aeration process that helps with softness, comfort, and durability. That said, this bed is more budget-friendly than other latex beds I’ve seen on the market. 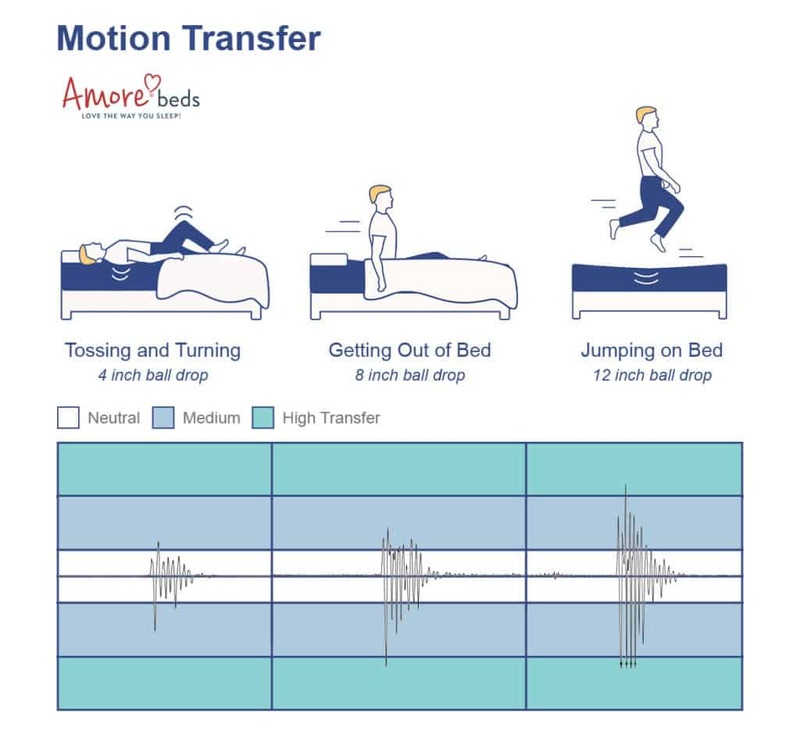 The mattress doesn’t isolate motion that well – While bounce and mobility help ensure you don’t feel stuck in bed, this often means motion will be transferred more easily across the mattress. If you share the bed with a partner who tosses and turns a lot in bed, this could become a disturbance for you. It lacks contouring pressure relief – If you’re looking for that plush, contoured sinkage and support from a bed, you won’t get that with the Amore. If you want deep pressure relief, consider something that utilizes memory foam. If you think the Amore Hybrid mattress is a fit for your sleep needs, see if it’s also a fit for your budget. If you’re interested in bringing the Amore Luxury Hybrid mattress to your bedroom, here is some info on cost, shipping, and sleep trial. That’s it for me and the Amore Hybrid review! If you have any questions or thoughts, leave me a comment below!